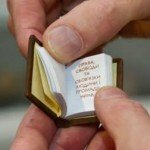 A miniature book has a very small size, from .5 inches square to about 2 by 3 inches high, wide, or thick. Miniature books became rather popular in the late 19th century. These portable books were easy to conceal and a person could easily pack a number of books in a small case when traveling. 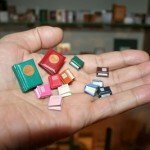 Many miniature books are very beautiful. Some of them are bound in fine Moroccan leather or gilt and feature astonishing examples of etchings, woodcuts and watermarks. In the 19th century miniature books such as dictionaries, language translators, religious stories and sometimes tourist guides were very widely used. Later the subjects of miniature books became more varied, ranging from the Bible, encyclopedias, music, rhymes and famous speeches, to the miniature versions of well-known books of that time, such as “The Compleat Angler”, “The Art of War”, and Sherlock Holmes stories. These days many of these rare books are in private collections and the price of these collectors’ items can range from a few hundred to many thousands of U.S. dollars. Among the notable miniature books are “Mini Constitution of Ukraine”, “Art in Miniature” by Margaret Hicks, as well as tiny books by Peter and Donna Thomas Good Book Press and Ian and Helen Macdonald’s private press (The Gleniffer Press 1968-2007). There are several notable collections of miniature books. One of the largest collections of miniature books (ten centimeters or less in height) that numbers about 1,600 titles is housed at the Library of Congress, Rare Book and Special Collections Division. 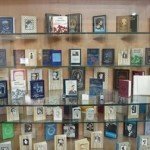 There is also an extensive collection of miniature books at Baku Museum, the only museum of miniature books in the world. If you would like to enrich your private collection of books with several miniature books consider purchasing them at Half.com. This online store offers a huge selection of discounted new and used books, including miniature ones. To obtain a discount and make your purchase even cheaper check out Half.com Coupon Codes.